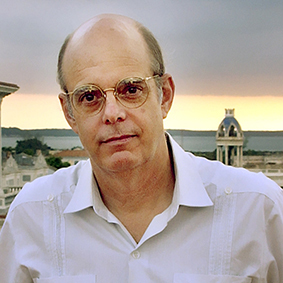 From the May 2014 Desktop News | Dr. Vernon James Knight’s archaeological research in Cuba has earned him the National Prize from the Cuba Academy of Sciences, a major national award in that country. Knight, a professor in the Department of Anthropology and curator of southeastern archaeology at UA, received the award for research he conducted at the archaeological site of El Chorro de Maíta in eastern Cuba. The international collaborative research project lasted from 2006 to 2012 and involved researchers from five countries and seven institutions. The award for the project was given, in part, because of the large amount of publicity the project received worldwide. At least 36 articles were published about the project, including publicity generated by the BBC, the New York Times, the National Geographic Society, and American Archaeology magazine. Thanks to information uncovered by the researchers, the project has also radically changed the way scholars understand the historic site, which is now recognized as a village of indios encomendados, or indigenous individuals who served the Spanish colonizers under a regime of forced labor. Knight obtained two grants from the National Geographic Society in order to determine the size of the village, identified preserved domestic areas within the site, excavated some of those areas, and dated the deposits and the site’s central cemetery using the radiocarbon method. A team of University of Alabama graduate students, including Paul Noe (M.A. 2007) and Brooke Persons (Ph.D. 2013) worked alongside Cuban archaeologists during the project and based their own research projects, in part, on their work in Cuba. Knight, an archaeologist, has published on field work and museum studies in the eastern United States and the Caribbean. His research interests include prehistoric social archaeology and the archaeology of early European-Indian contact. Recent books include The Search for Mabila (editor, 2009, University of Alabama Press), Mound Excavations at Moundville: Architecture, Elites, and Social Order (2010, University of Alabama Press), and Iconographic Method in New World Prehistory (2013, Cambridge University Press).